The fragrant blossoms of orange trees bloom in the spring and yield bountiful harvests of oranges within the first five years of planting. Most orange trees will reach heights of 20 to 30 feet, with an equal spread at maturity. Florida lies within USDA hardiness zones 8 through 11. Orange trees are hearty in zones 9 through 11, meaning that oranges will thrive anywhere in Florida south of Jacksonville and Ocala. Prepare the soil for planting. Orange tree planting can take place during any season in Florida, provided the planting site is prepared beforehand. Work the soil with a pitchfork or rototiller, breaking up large chunks of earth and removing rocks, weeds and debris. Test the soil before planting orange trees. Most citrus trees prefer soil with a pH between 6.0 and 8.0. Florida soil acidity varies throughout the state, so amending may be necessary before planting. A soil test can help you determine the acidity of your soil. Amend the soil with lime, after tilling, if the soil pH is below 6.0. If you soil test reveals a pH above 8.0, add peat moss to the soil. Dig holes in the amended soil to accommodate the orange trees. Space the holes at least 15 feet apart. Dig the holes twice the width of the orange trees' nursery containers with a depth equal to their height. Remove the orange trees from their nursery containers and set one tree in the center of each hole. Florida orange trees require planting with their graft unions (transition point where roots meet trunk) above the soil line. If the graft union lies below the soil line, add more dirt to the hole. Backfill the holes to the halfway point and moisten the soil with water from a garden hose to secure the roots. Continue backfilling, patting the soil afterward to remove air pockets. Water the Florida orange trees generously after planting. Use a soaker hose to deliver water deep down to the roots of the trees. Soak the soil to a 1-inch depth, maintaining that moisture depth throughout the first growing season. Feed the orange trees a diet of citrus fertilizer two to three weeks after planting. 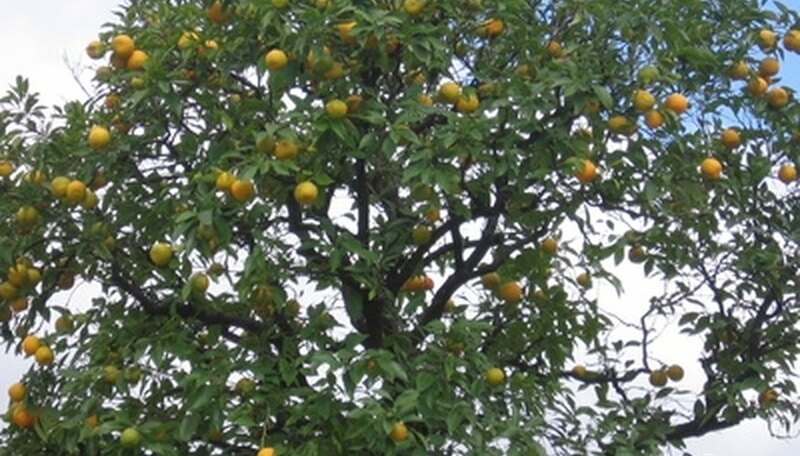 Orange trees planted in amended Florida soils do not require fertilizing during planting, but will require fertilizing after they begin to show signs of growth in the following weeks. Prune the orange trees during the late fall or early spring in Florida. Remove dead or damaged branches with a pruning saw or pruning shears. Inward-growing branches will also require pruning at this time. Florida rainfall averages vary throughout the state, but yearly averages are around 54 inches. Maintain the 1-inch soil moisture range with supplemental watering if it doesn't rain. Harvest the oranges when they ripen in the fall. Do not overwater the orange trees. If the soil feels moist at a 1-inch depth, skip the supplemental watering and check the soil again in a few days.